Airline credit cards offer perks like free checked bags or airport lounge access while also making it easier to rack up points or miles and save money on flights. We analyzed 148 co-branded airline cards based on miles value, rewards rate, and other benefits to find the best cards for each major airline. Here are the best offers from our partners. 2 miles per dollar at US restaurants. 1 mile on every eligible dollar spent on other purchases. Choosing a credit card can be difficult, and choosing the “right” one for your needs can be even more of a challenge. If you fly often, you'll want to make sure the card you select helps you maximize your opportunity to earn airline status as you spend money on flights. With the new year ahead, now is a good time to learn how you can use credit cards to save on airfare for your upcoming trips. We've compiled a list of the best airline credit cards for your needs, and this guide will walk you through how to select the right one for you. What are airline credit cards and how do they work? Can you transfer miles between airlines? Multiple criteria influenced how we picked the best card for each airline. We recognize that the best things any airline card can do for you is to help you save on airfare with free flights and make the airport/flying experience more tolerable (and, with the right perks, even enjoyable). 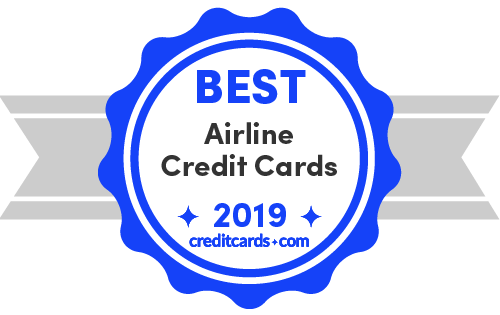 For a full list of criteria and more detail on our review scores, see our ratings process for airline cards. As one of our highest rated credit cards, the Venture Rewards card is great for airlines and all things travel. Its list of airline transfer partners currently stands at 14, with a transfer ratio of 2:1.5. You can get a head start on miles by hitting the sign-up bonus of 50,000 miles for spending $3,000 in purchases in your first 3 months. Not only is Venture a robust card for airlines, it is also highly lucrative for hotels, as you earn 10X miles when you book and pay through hotels.com/venture. With unlimited 2X miles on all other purchases, you'll be able to continue stacking up the rewards. The current airline partners largely consists of international airlines rather than major U.S. based carriers. Also note that there is a $95 annual fee, but it is waived for the first year. Earn 60,000 points after a $4,000 spend within the first 3 months, and earn 2X points on worldwide travel and restaurants. With the Chase Ultimate Rewards portal, those 60,000 points become $750 when redeemed for travel. You get 1:1 point transfer with partners, a 25% bonus on travel rewards and this account can be married with other Chase cards. Also, the Chase Sapphire Preferred's auto rental insurance is superior: the auto rental collision damage waiver serves as primary coverage when you decline the rental company's collision insurance and charge the entire rental cost to your card, meaning that you don't have to claim payment with another source first. All in all, it's one of the best credit cards for travel. There is a $95 annual fee, which is not waived in the first year. While the CSP can be used for booking airfare on any airline, the trade-off is that you don't get some of the same airline-specific benefits offered by co-branded airline cards. Like the Rapid Rewards Premier and Priority cards, this card offers the same sign-up bonus of 40,000 points for spending $1,000 in your first 3 months. However, that's with a lower annual fee of $69. You also get 2X points for Southwest purchases, as well as partner hotel and car rental purchases. This card has no blackout dates and no seat restrictions. The anniversary bonus of 3,000 points is lower than the Premier's, and there's no annual travel credit. Featuring the same sign-up bonus as the other two Southwest cards, the Priority has the largest anniversary bonus of the three at 7,500 points on each cardmember anniversary. Additionally, the Priority distinguishes itself with a $75 Southwest travel credit each year. Ongoing rewards are generous – 2X points for Southwest purchases, as well as Rapid Rewards hotel and car rental partner purchases. You can also get 4 upgraded boardings each year when available and lost luggage reimbursement. In exchange for its premium benefits, the Priority card charges a $149 annual fee, making it less palatable for the fee-averse consumer. The sign-up bonus is very solid at 40,000 points earned for spending $1,000 in your first 3 months. You'll also earn 2X points on Southwest purchases and 1X points on all other purchases. This card encourages long-term loyalty, delivering 6,000 miles on your card anniversary. There is a $99 annual fee that isn't waived the first year. Also note that Southwest only flies internationally to the Caribbean, making it a primarily domestic airline. This card's 30,000-mile welcome offer after a $1,000 spend within the first 3 months is a very solid bonus for Delta flyers. This required spend is very reasonable for the size of the bonus. Plus, you can get a $50 statement credit for using your new card to make a Delta purchase within the first 3 months. There's priority boarding and the first checked bag is free. Features include discounted Delta Sky Club access, ticket presales and VIP events, car purchase discounts and more. With Pay with Miles, you have the option to redeem miles for all or part of the price of your tickets on Delta.com. There is an annual fee of $95, although this is waived in the first year. As far as earning rewards, it is not the most impressive out there, with 2 miles per dollar only on direct Delta purchases and only 1 mile per dollar on other purchases. Another rare airline card with no annual fee, this card's 10,000-mile welcome bonus may not be much to write home about, but there's only a $500 spend within the first 3 months. Earn 2X miles at U.S. restaurants and on purchases made directly with Delta. Also, receive 20% off purchases in the form of a statement credit on eligible Delta in-flight purchases of food, beverages, and audio headsets. This card falls short of the value offered by the Gold Delta SkyMiles card, although the latter charges an annual fee. In addition to a strong sign-up bonus and Companion Fare offer, this card offers no foreign transaction fee, no blackout dates and unlimited miles. The Alaska Airlines Visa Signature credit card has a $75 annual fee that isn't waived the first year and spending other than that made at Alaska Airlines only earns 1X mile. The 40,000-mile sign-up bonus comes after a $2,000 spend within the first 3 months; there is an additional 20,000 bonus miles after a $8,000 total spend within the first 6 months. You can earn 2X miles with hotel stays and restaurants, as well as United purchases. You also earn up to a $100 fee credit for TSA PreCheck or Global Entry. You can also get priority boarding privileges and visit the United Club with 2 one-time passes each year for your anniversary. There is an annual fee of $95 (waived for the first year). First, let's briefly discuss frequent flyer programs offered by airlines, because the whole point of an airline co-branded credit card is to earn miles and save on flights with your carrier of choice. Frequent flyer loyalty programs are very straightforward: They allow airlines to incentivize travelers like you to keep your business with that airline by offering you credit for every mile you fly with that airline. Once you accumulate enough miles, you can then redeem them for free travel with that airline in the future. The concept is simple enough, but every airline differs in its program management, accrual schedule, and redemption availability for award flights. Most airline credit cards offer generous rewards and perks such as free checked bags (which come in handy when you and the family are meeting up at a beach condo this summer with loads of luggage), or airport lounge access, as well as accelerated progress toward elite status. Furthermore, many cards offer a sizable sign-up bonus of mileage points when you first open your account, which usually can get you far toward an international round-trip ticket or a couple of domestic round-trip flights. You spend a significant amount of money specifically on air travel every year. If you don't travel often, or if the destinations you frequent aren't offered through your airline and associated partners of choice, you might want to consider getting a generic travel credit card that allows you to transfer points to your travel program of choice. The Chase Sapphire Preferred is one of the most popular cards in this category. "If you fly the same airline all the time, it might make sense to put all of your credit card spending on that airline's co-branded card," advises Ted Rossman, CreditCards.com industry analyst. "But if you're more of a free agent – you fly different airlines based on the schedule, price, destination, etc. – then you're better off with a general-purpose credit card." You have good or excellent credit. You will want to have a FICO credit score of at least 670 before applying for an airline rewards credit card, which typically requires great credit. You are able to pay off your balance each month. Interest charges are no joke, and can quickly cost you far more than your rewards are worth. Ideally, you should be debt-free and always avoid carrying a balance on any credit card you hold. It may seem straightforward – spend on your card, get miles, redeem, rinse and repeat. But there's more to it than you'd think. You'll want to time your purchases, time which card you use, and more. We get into it here. This is a big one. You'll want to make sure, for example, that you spend the required amount before the sign-up bonus deadline hits. Typically, you have 3 months to spend a set amount in order to receive the sign-up bonus. Also, you may consider making a big purchase (that you can pay back in full) before a planned trip to top off your points. For example, you might plan to earn miles with spring renovations that can be used for your summer vacation. Different cards offer different ongoing rewards, so it might be worth your while to have multiple cards, depending on your spending habits. So, you might use your Chase Sapphire Preferred on worldwide travel and restaurants, earning 2X points, while you can use your United Explorer card on hotels, earning 2X points. When do you get your miles? Once you've earned your miles, you would think you would get them almost immediately, because you've met the requirements, but not necessarily so. For example, Chase says it will take 6-8 weeks before your sign-up bonus points are posted, but it can be less. That brings us back to making sure you time when you make your purchase, and ensuring that those miles will post before the big trip. Trying to earn miles to visit family in the next few months? Make sure you spend enough in time to get those rewards back in order to redeem them. Now that you're on your way to earning points or miles, you may think the easy part is ahead. But not so fast. Miles' values vary not only between airlines but also between types of redemptions. For example, with the Delta SkyMiles, flights are valued at 1.35 cents, while upgrades are valued at an incredible 2.2 cents, while merchandise is only 0.4 cent. And programs such as AAdvantage allows you to redeem miles for everything from flights and upgrades to gift cards. But while the value of miles is strong for flight awards and upgrades (Business/First MileSAAver trades at a whopping 3.8 cents), that isn't always the case for other redemptions. You can do your own check to see how many miles you need from the airline's website: Just look under the reservations page, and search for the section that mentions award flights. Most will offer a chart showing the regions to which they travel – usually broken down by continents – as well as a schedule showing how many miles it takes to get from one region to another. For instance, the lowest one-way domestic fares on American Airlines will cost you 12,500 AAdvantage miles within the continental U.S., although the same flight will only cost you 4,500 Avios when booked through OneWorld partner carrier British Airways. You may be required to have a minimum before you can redeem, as in the case of the Arrival Plus, which requires you to have at least 10,000 miles before you can redeem. To maximize your redemption, you need a plan. And part of that plan is to redeem your miles as soon as you can while still reaching your goal. That's because points can lose their value over time. For example, Qatar Airlines' Qmiles were worth 1.1 cents in December 2017, according to our points valuation, and are now worth 0.8 cents. Also, the miles can even expire if you don't pay attention to the rules. Another note about paying attention to the rules: Played right, you can maximize the use of your miles. For example, British Airways is notorious for charging an incredibly high number of points for redeeming seats in first and business class. A first-class seat on Cathay Pacific between Boston and Hong Kong, for example, will cost an astronomic 200,000 Avios. In comparison, partner carrier American Airlines requires just 67,500 AAdvantage miles for that exact same flight. While the SkyMiles program is forever moving the finish line with everchanging point values and rules, there are no blackout dates and there are a number of redemption options. The average point value is 1.2 cents, and rewards don't expire. There are 31 airline partners. It's a good program for loyal Delta flyers and international travelers. With the United program award tickets are one-way, which actually opens up your options. You can have a different class each direction; or you can travel out with a Saver ticket when your plans are flexible, and with an Everyday ticket on the return with firmed up plans. You can use miles to request upgrades to a premium cabin, which allows you to benefit from free alcoholic beverages, as well as priority check-in, security line access, boarding, and baggage handling. With this loyalty program of Southwest Airlines, flight options are primarily limited to domestic destinations, but the rewards are strong. This program is particularly great for families with loads of luggage, which is inevitable when you're lugging kids and snorkels to the beach for Spring Break. Booking is flexible and there aren't a ton of hidden fees. While there are no blackout dates and one-way trips are permitted, it's not the largest of airlines, with only 90 destinations, and only about 10 countries. With more than 1,000 destinations to more than 150 countries, American Airlines is one of the largest airlines in the world, ideal for world travelers. The airline partners with OneWorld Alliance carriers as well as other partners. While there's the MileSAAver awards, which means you can book award flights at a low number of miles, there are downsides, such as some quirky rules and the need for flexibility when booking. Another OneWorld partner, British Airways can eat up your miles, called Avios, but the experience is superior. There is a feature called Reward Flight Savers, advertised as the best value reward flights, which is available on return flights in Europe and southern Africa. Like other loyalty programs, you can use Avios to upgrade, for a hotel stay or getting a rental car. With all those great choices, picking the right airline card can seem overwhelming. Well, we do the heavy lifting to help you make the right decision. Here are 6 factors you should consider when choosing between two airline credit cards. Here, we look at the Blue Delta SkyMiles and the United Explorer card. Consider which credit card's sign-up bonus is more lucrative and more attainable. If two cards have the same required spend, the one with the higher bonus amount is favorable. If two cards have the same bonus amount, the one with the lower required spend is favorable. Some airline credit cards offer rewards outside of the realm of airline loyalty, making them competitive with general-purpose travel cards. For example, you can enjoy boosted rewards at restaurants and for hotel stays with the United Explorer card, while the Blue Delta SkyMiles earns 2X miles at U.S. restaurants. The benefits for airline cards can be robust, with no foreign transaction fee; first free checked bag; priority boarding; and up to $100 credit for Global Entry or TSA PreCheck for cards like the United Explorer. Meanwhile, the Blue Delta SkyMiles offers auto rental insurance, an extended warranty program, purchase protection, as well as presale tickets. Annual fees are not a burden if you think through how you're going to use the airline card. Some airline cards offer the first year waived. Others, such as the Blue Delta, have no annual fee at all. But compare the points or miles and the points valuations (up next) before making a decision. The best and easiest way to compare points valuations is with The Points Guy's ongoing research. As you'll see, United MileagePlus trades at 1.4 cents, while Delta SkyMiles trades at 1.2 cents. Where do you live and go? One final thought: Keep in mind that you'll want to pick a card partnering with an airline you'll actually use, or there's no point (pun intended) in earning all those amazing miles. For example, American Airlines has a hub in Charlotte, while United has a hub in Houston, and Delta is based out of Atlanta. Where you live and go should factor into your decision. A lot of people consider airline miles to be comparable to cash. However, airline miles are a little bit more like currency from different countries: Many places will not allow you to pay with money from another country. Similarly, you can't transfer points between frequent flyer programs in most cases, even if the airlines are partners. Partnerships such as OneWorld, Star Alliance, and SkyTeam typically allow you to earn miles when you fly on one airline, and redeem those miles you earn for flights on a carrier within the same network. However, most of those airlines won't allow you to transfer miles directly from one carrier to another, because there is no financial benefit to them for doing so. But there are some exceptions to the rule. British Airways and Iberia share the Avios frequent flyer program. So while your points in each program remain separate and distinct, you can transfer them freely between the two so long as both accounts are at least 3 months old. Just because you can't transfer points back and forth, however, doesn't mean that you are stuck with a single carrier for life. Most airlines within the major alliances will allow you to use your mileage stash with that brand to book award flights on partner airlines. For example, an American Airlines frequent flyer can use AAdvantage miles to book a flight on British Airways, and the cost of that ticket will be based on the American Airlines mileage award chart. So even though that traveler will physically fly on a British Airways flight, the passenger is subject to all of American's ticketing rules; responsible for paying any change or redeposit fees to American; and must contact American – not British Airways – with any problems or issues that may arise before departure.